Last week while I was sick and home alone, I went to make a sandwich only to discover that we were out of salad cream and mayonnaise so I set about making my own. I'm pretty sure the last time I made mayonnaise from scratch was when I was 11 and in the Brownies, but this is a very easy recipe and came out really well. 1. Using a food processor, crack in eggs, add mustard, salt and vinegar and turn to a medium speed. 2. Very slowly drizzle in the oil in a small steady stream. You can then put in a container and store for 2 weeks in the fridge. 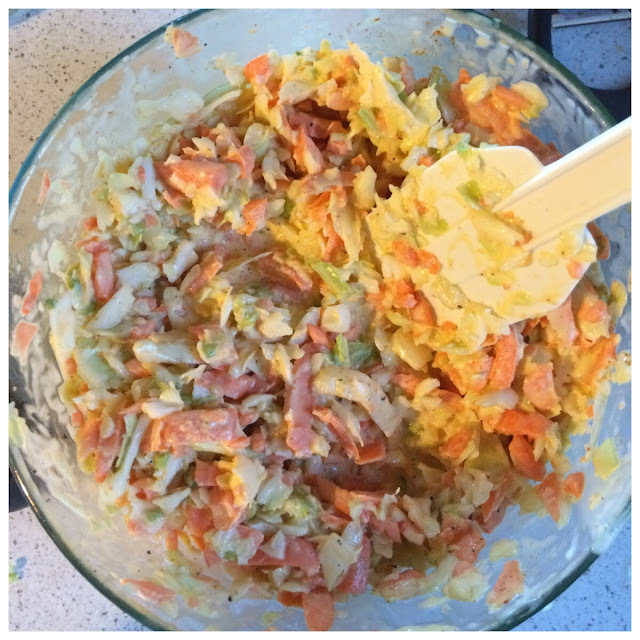 Yesterday evening I decided that I would use up the leftover quarter cabbage and mayonnaise by making a coleslaw. 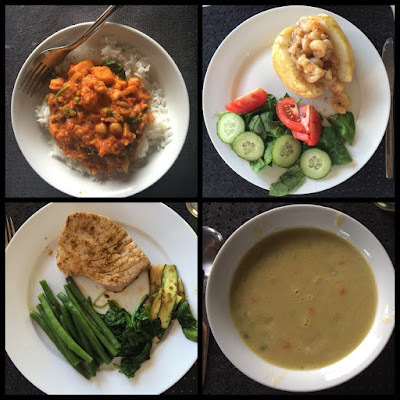 Again, another easy recipe with all the hard work taken out if you have a food processor! 1. Shred the cabbage and then shred the carrots. 2. Stir in the mayonnaise and mustard and mix well. Adjust amounts to taste and add pepper. However, as I began to shred the cabbage my food processor made a horrible clacking noise and I checked to find that the shredding attachment hadn't seated itself properly and was catching on the lid. I adjusted it and continued on shredding the cabbage and the carrots. I then proceeded on with my recipe and then decided to experiment a bit more adding in chipotle tabasco sauce and cayenne pepper when suddenly I bit down on something hard and spat out a small shard of plastic. I looked at the lid I had put in the sink and yes, it was quite broken. There was just too much broken away that there was no way we could have eaten the coleslaw safely. I wasn't very happy - the coleslaw was really tasty! 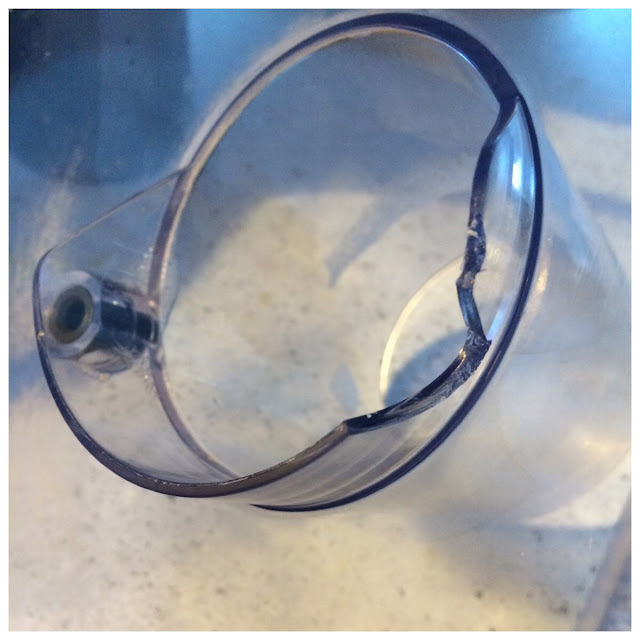 Thankfully, I found a replacement lid on a website called NeedAPart.co.nz and I have bought from them before so hopefully that will arrive soon and I can use my food processor again! Oops I completely missed out a Currently In March post! Reading: Nothing at the moment, I'm in between books. 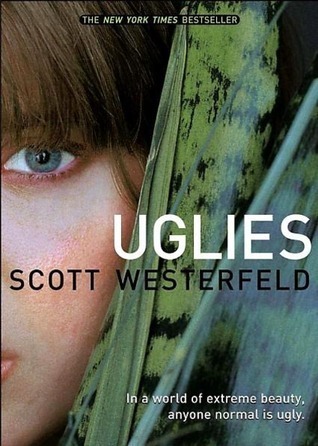 I've finished Eleanor & Park by Rainbow Rowell and I'm about to start reading Uglies by Scott Westerfeld. Watching: Being Erica, it's about a 30 something women whose therapist lets her time travel to fix regrets she has from her past. I've binge watched season 1 and 2 and I'm starting on Season 3. Feeling: Stressed and pulled in too many directions! I know I do this to myself - I've just taken on the role of my Lions club president too! Thinking: about doing some baking for the Lions event this weekend and also for my own freezer. I would love some ginger cake right now! Anticipating: Wanderlust 108 at the end of the month. Looking forward to a day of running and yoga. Listening to: Spotify playlists. I found a couple of good ones while reading Eleanor & Park so I was listening to the Smiths, Joy Division, U2 and the Cure. Planning: A cinema trip since I just won a survival tool and free tickets to see 10 Cloverfield Lane. Working: on a community cookbook as a fundraiser. We've had one very productive meeting so far and it's set to be a really fun and tasty project. Grateful: To the City Riding Workshop leaders on Sunday for a great introduction to cycling in the city. It was a fun day, even though most of it was done in the rain, and we learned some invaluable skills. 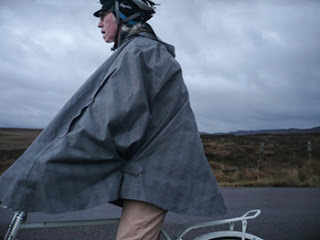 Wanting: A fancy rain cape like one of the ride instructors had. It looked like a Sherlock Holmes style cape with part of the check pattern being reflective in the right light. Needing: To lay off the junk food. My diet was going so well but I've just been stress eating for too long now. 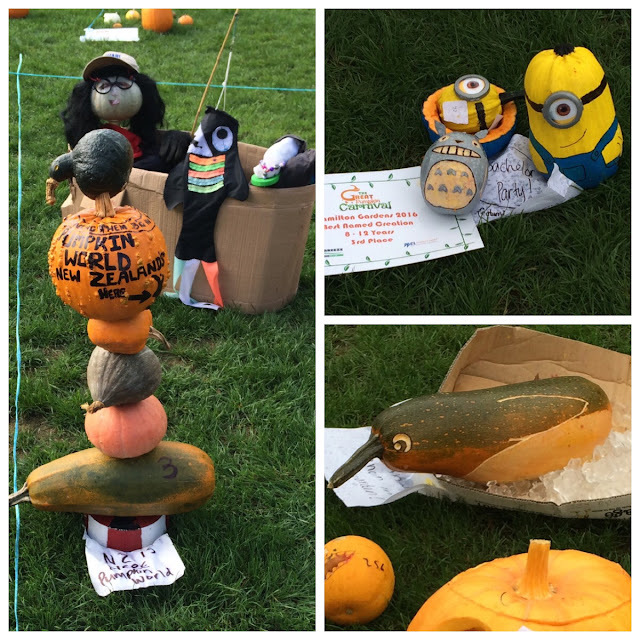 Loving: Apples and all things apple related! Wishing: My friends all the best with their new baby! 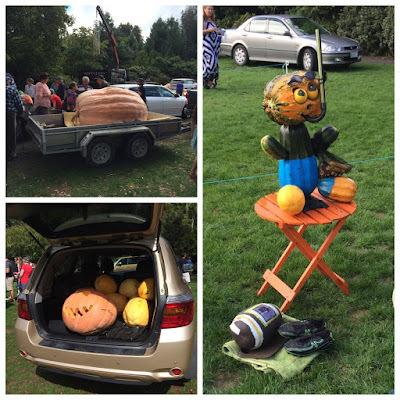 At the weekend we went to the Great Pumpkin Carnival in Hamilton. We went to this for the first time last year (which I mentioned in this post: Weekend Recap) and had a fun experience but this year I wanted to take part in the pumpkin baking contest. The clocks went back an hour at 2am on Sunday morning so I had the luxury of a little extra sleep before I started baking. I made pumpkin chocolate chip muffins and they were barely out of the oven before we taste tested them. We 'taste tested' a half dozen of them and selected the 4 best looking ones for the box before jumping in the car for the 1.5 hour road trip down to Hamilton. I love a good road trip and I love driving in the Waikato, the countryside scenery reminds me of home. Once we arrived in Hamilton Gardens I went and registered my muffins. 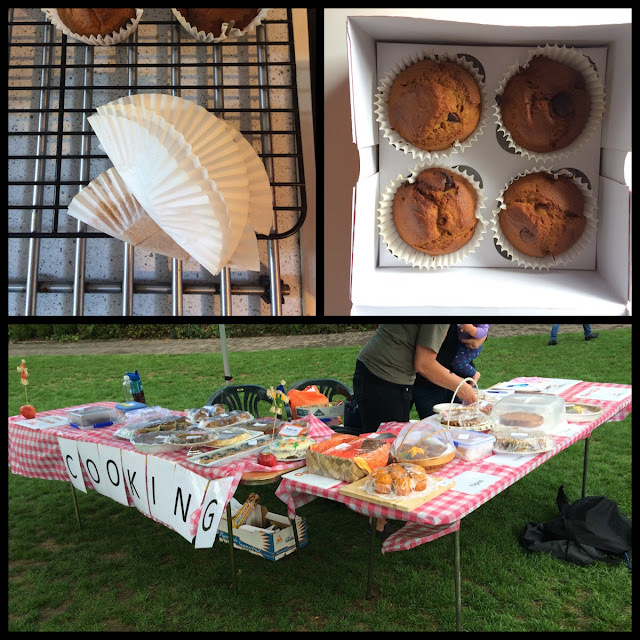 There were 3 categories, Muffins & Scones, Pumpkin Cake, and Pumpkin Pie. 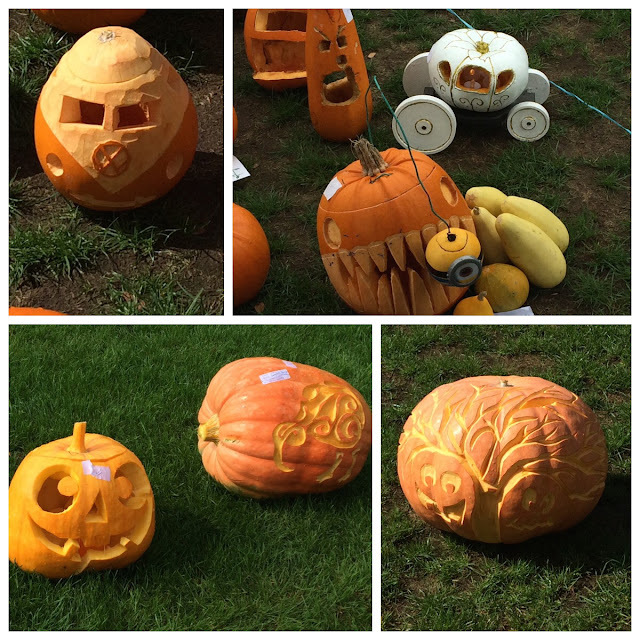 Then we wandered around to look at the pumpkins entered into the other contests. 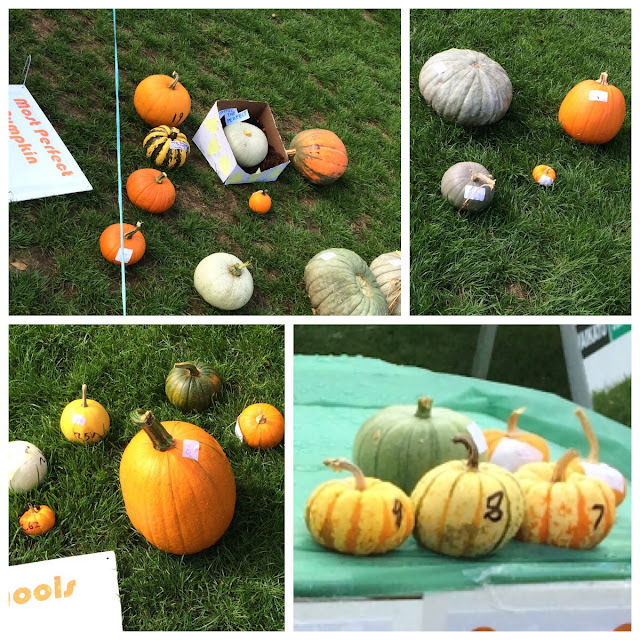 It was very visually satisfying to look at the entrants into the Most Perfect Pumpkin and Best Mature Miniature Pumpkin categories. 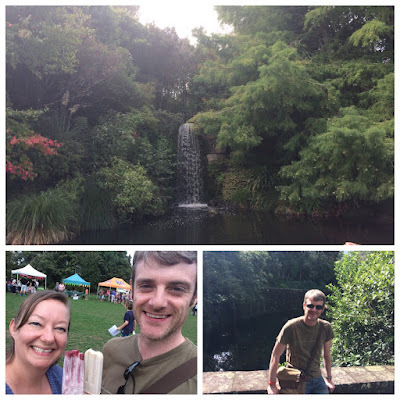 We took a break from pumpkins, got some tasty dairy free ice blocks and wandered around the roses and other parts of the gardens we hadn't been to before. We had some lunch and saw some square dancing that was happening nearby - it's a different world outside of the city! We returned to the pumpkins in time for the Pumpkin Racers. The crowd were quite enthusiastic. The giant pumpkins are very popular and there are two categories, Heaviest Pumpkin Over 200kgs and Heaviest Pumpkin Under 200kgs. Tim Harris has won in the over 200kgs category for the past 5 years and his winner last year and again this year has been a record breaker! 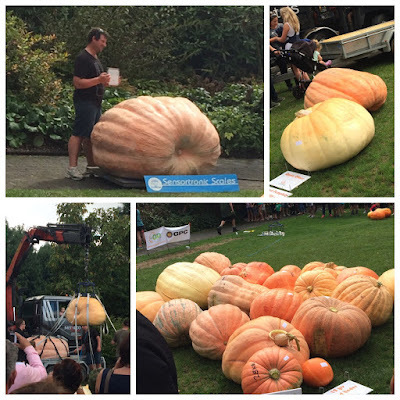 This years winning weight was 789.5kg while the second place one was 260kg - amazing! 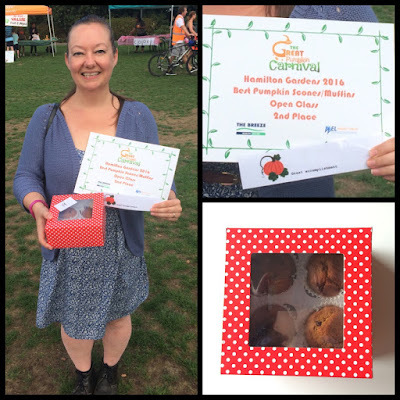 I was absolutely delighted to find my muffins had come second place! 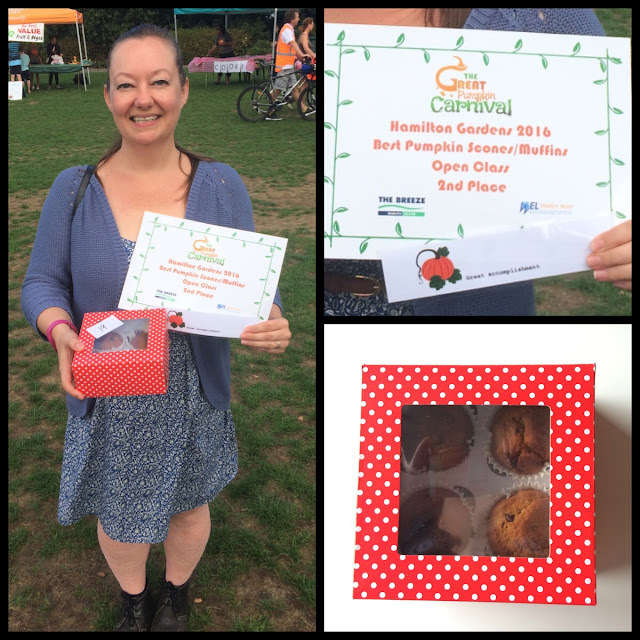 I'd never entered a baking contest before and it was so exciting to take part, I never expected to place. I'm already thinking about next years event and all the categories I want to enter haha! 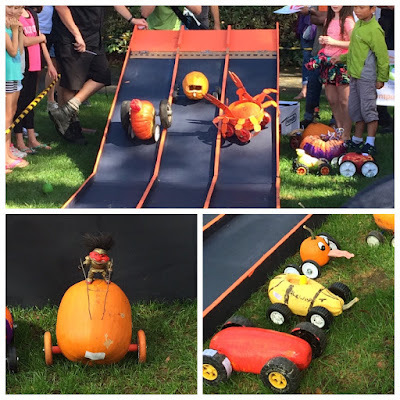 All the competition results are on the Great Pumpkin Carnival website. Have you ever entered a baking or vegetable competition? If you have any good pumpkin recipes let me know in the comments! I've really felt the change of season this month. It's become noticeably cooler in the evenings and the clocks go back an hour this coming Sunday. Motivation has waxed and waned and some days I'm running racing and eating sensibly while on others I barely leave the sofa and eat too many creme eggs. The hot chocolate cravings and desire to hibernate are there already but it's far too early for all that! I finally bought the Le Creuset mini cocottes that I've been coveting for years and made and served lots of food in them this month. 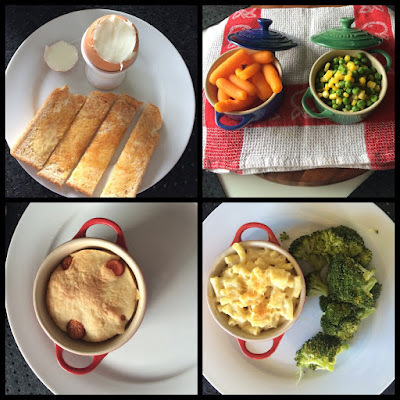 I had my first attempt at making toad in the hole but as I was in the process of making it, I realised that I used the eggs that I thought I had so I used the egg replacer I had in the cupboard. It was edible, but perhaps a bit drier than it would have been otherwise. I upgraded my spice rack with some garam masala and cumin to make a kumara and chickpea curry as my last attempt using generic curry powder was too bland. I'm pleased to say that the new spices really bolstered the flavour. And as I mentioned in my Pi day post, I did make chowder out of the left over vegetables. I blended half of the vegetable mix and added shrimps and some salt and pepper. It made a really tasty, hearty soup that I'll definitely make again. I read 3 books this month to keep me on target to read 24 books by the end of the year. Ella Minnow Pea by Mark Dunn, was an amusing read. I heard about this book over on Lisa's blog and it lived up to expectation. 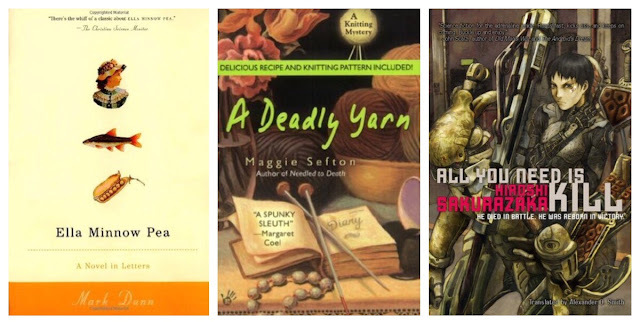 A Deadly Yarn by Maggie Sefton is the third book in this series that's become a bit of a guilty pleasure of mine. Books that include recipes and knitting patterns? Sign me up! All You Need Is Kill by Hiroshi Sakurazaka is a short read that the film Edge of Tomorrow is based on. I enjoyed the movie and I really liked this book. It's a bit different from the movie so it didn't ruin it for me having seen the movie first. I finally got my jeans hemmed and I bought some new shoes and red pants that I've not worn yet but hopefully that means I'll have some new looks for next month. This month however I've only got my silly outfit I wore for a St Patrick's day dinner and a head band that I knitted. I love this pattern and its available for free on Ravelry. 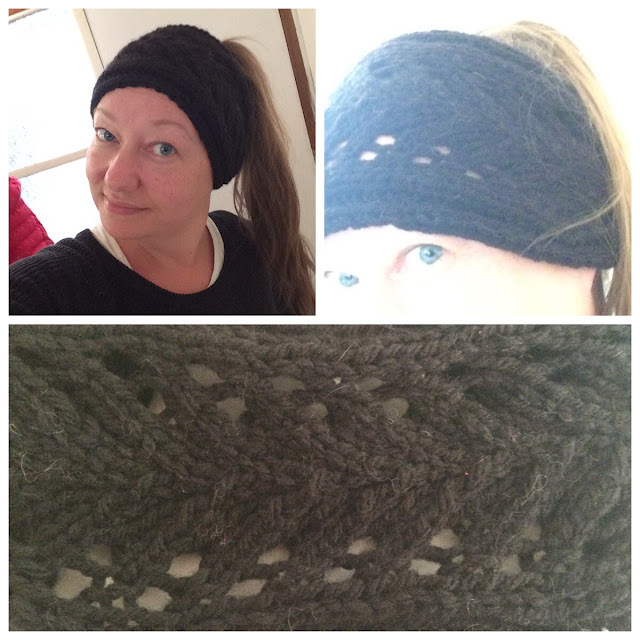 I'm not the fastest knitter but it took less than 2 hours to have a finished wearable product.